At Mosston School you can expect to find modern classrooms that are regularly updated and maintained. We have 7 classrooms which are complimented by our Discovery Centre, teaching hub, and Hall. These extra buildings allow the teachers more flexibility with their teaching programmes. Our learning spaces are air-conditioned. In our Discovery Centre our library books are continually replaced or added to, to ensure student interest remains high. Learning spaces are equipped with smart televisions and a school wide internet network with cabled and WiFi options. We offer free WiFi to our school community. All internet access is regulated to encourage safe use by our users. At Mosston we place a strong emphasis on eLearning. We operate a Bring Your Own Device (BYOD) programme for our Year 3 and up pupils. Our BYOD devices are Chromebooks. Our Junior school uses a mix of android and iPad tablets. Students have access to the network via school wide cabling and wireless technology. We receive our internet via Ultra Fast Fibre. 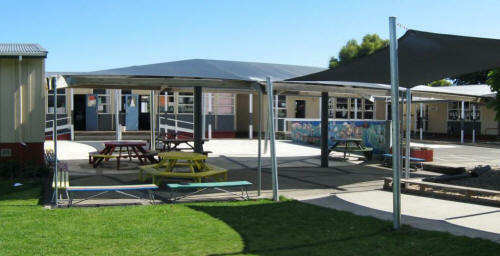 The school has invested in a school-wide sound system and for use in assemblies and in the playgrounds. Student safety is a priority so the Ministry of Education has funded a large off road car park which allows safe transition of children from their cars to their classrooms. Our school hall is a fantastic facility for many events and activities, including after hours uses. For full school occasions such as end of year prize giving we utilise the Central Baptist Church. For swimming, we travel to the Splash Centre for 12 weeks of the year in the summer terms. Exciting adventure playground areas areas exist on either side of the hall Our sun shaded sandpit is a popular spot for the tamariki. We have developed cycle and scooter tracks to encourage development of skills and yet another way to get our children moving. After school care and school holiday programmes are provided by SKIDs and YMCA OSCAR programmes.